NASA’s Mars Reconnaissance Orbiter (MRO) space probe was observing the area of ​​Mount Sharp long before the Mars Rover Curiosity arrived and its instruments detected signs of the presence of clay minerals. That’s one of the reasons why it was decided to send Curiosity to that region but it reached Aberlady to drill its bedrock only almost seven years after landing because there were so many interesting places to study. Curiosity discovered clay minerals already in 2013 in an area called Yellowknife Bay, among the discoveries that convinced NASA of the ancient conditions favorable to life on Mars. 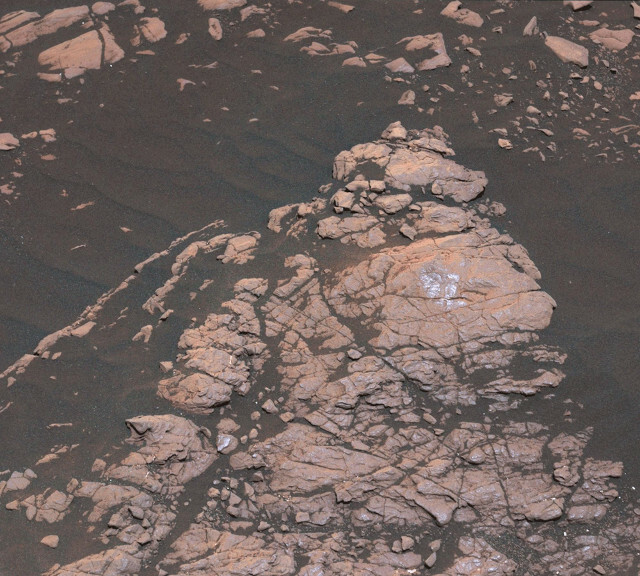 At last, after almost seven years of travel, the Mars Rover Curiosity reached Aberlady, on April 6, 2019, that is Sol – Martian day – 2,370 of the mission, proceeded with the drilling of the bedrock and then took samples of the minerals clay present in the rock to be analyzed with its portable laboratory, in which they were put on April 10, that is Sol 2,374. The top image (NASA/JPL-Caltech/MSSS) shows a photo taken by the Mast Camera (Mastcam) of the drilled spot. The Mars Rover Curiosity mission’s scientists are taking a look at the surrounding area to evaluate other spots to be examined in depth. The bottom image (NASA/JPL-Caltech/MSSS) shows a mosaic of photos taken by the Mast Camera (Mastcam) which include the area nicknamed Knockfarril Hill in the center-right and the boundaries of the Vera Rubin Ridge, the area of ​​the Gale crater in which Curiosity worked for months, at the top. The rocky spots of the area have various bedrocks but also pebbles and sand slowly moving. Ashwin Vasavada, one of the Curiosity mission scientists at the Jet Propulsion Laboratory, explained that each layer of Mount Sharp is a piece of the puzzle that offers clues to Mars history. The results of Aberlady’s sample analysis will be helpful in deciding how to continue the research in that area. The plan is to carry out more drillings during the next year but it also depends on which spots will reveal the most interesting features. Different areas show different geological features and the research will be conducted in order to obtain the most complete information on the complex history of Gale crater and Mount Sharp.